Meet our Cultural Historian Certified Tour Guides as they give 90 minute walking tour of the Mid-Town Neighborhoods U Street and Shaw Washington, DC. These areas are the epicenter of the African American Art District. See these collections of curated murals by artists from around the world painted on the walls of our cities buildings. Join this 90 minute guided tour to learn about this unique street art in our Washington, DC neighborhoods. Hear how street art rose from an idea of beatification of neglected industrial zones to becoming a highlight of a community. You’ll learn about the artists who created the murals, the stories they tell about the neighborhood and the DC organizations who work to facilitate the creation and placement of these beautiful works of art. Group meets outside U Street Metro Station 10th Street Side. Please arrive 15 minutes early to meet your guide. Your tour guide will take you to different mural locations throughout several neighborhoods. Our focus for this tour is African American Washington, DC experience. 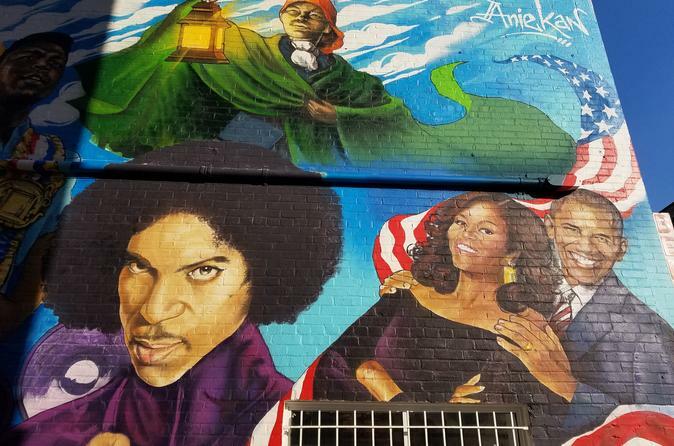 You will see different murals that our local Washington, DC neighborhoods painted on buildings to remember prominent artist, historic figures, and important moments. This is a walking tour where attendees at times will walk over uneven pavement, through alley ways, and street crossings. Please wear comfortable shoes to accommodate the varied terrain. Tour goes rain or shine unless conditions will cause an uncomfortable environment.